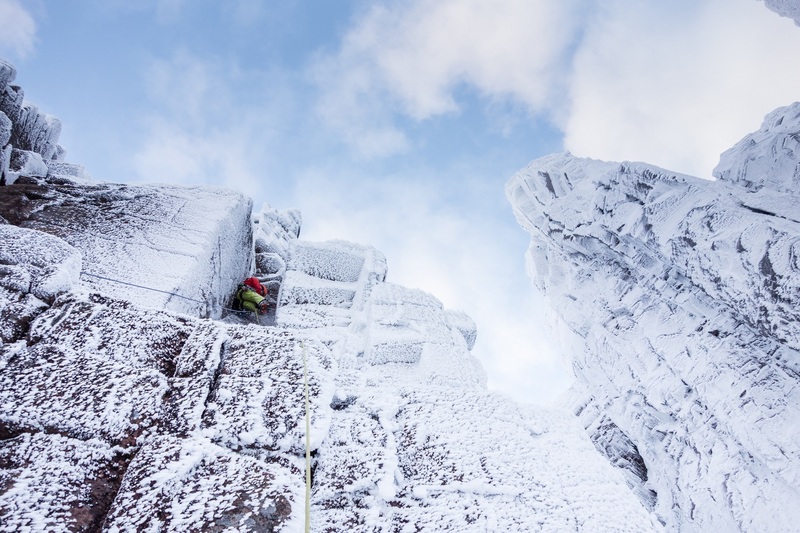 When it all comes together there really is nowhere else I would rather be winter climbing than Scotland. 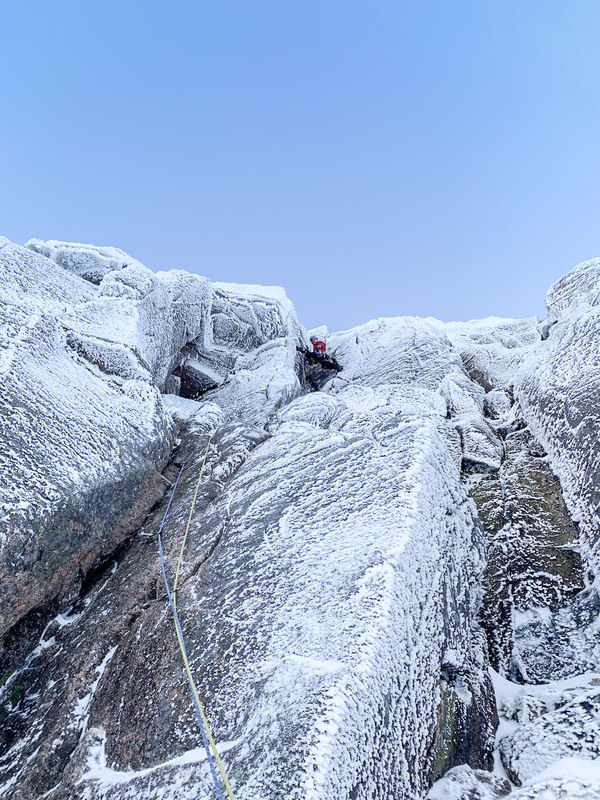 Even if that does mean another trip to the ever-reliable Norries… Cold north-westerlies earlier in the week had rimed the buttresses facing the wind and refrozen the turf, while depositing very little powder. Combined with Saturday’s forecast we knew it was going to be good, but it was clear when the sun came up that it was set to be a rather special day! 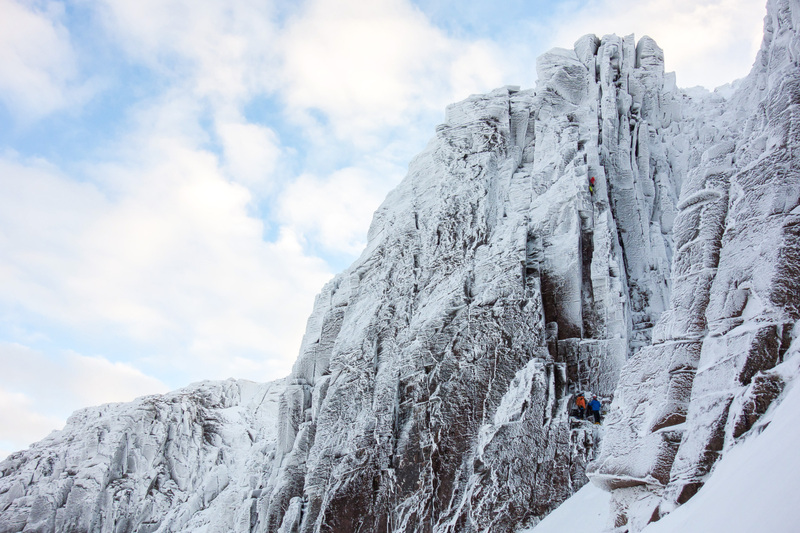 It was always going to be busy, so we got an early start into Coire an Lochain, ensuring we had first dibs. The Hoarmaster (VI, 6) was plan A and by the time I had dragged myself, sweating bullets, to the base of the route, Joe was already racked up and straining at the leash. He flew off the mark and scampered up the deceptively tricky start to the base of the famous chimney. 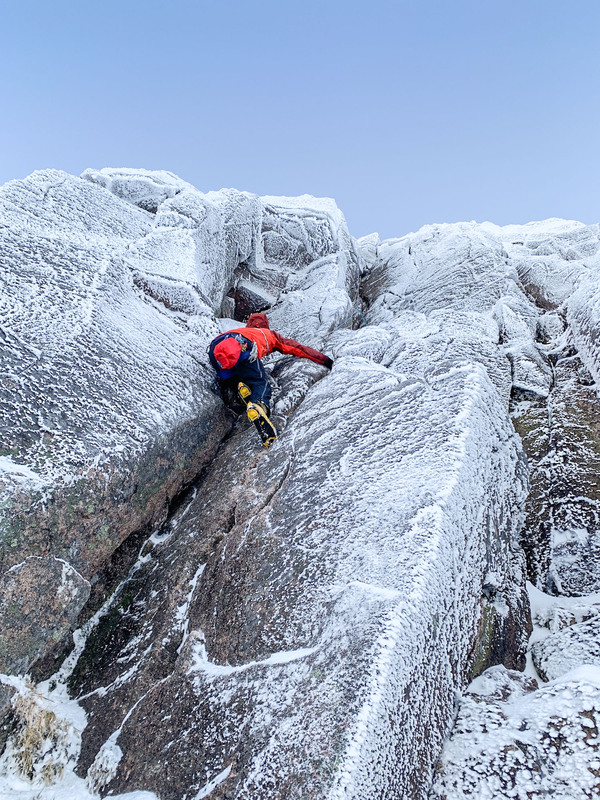 Joe frogging himself into the start of the chimney – one of the trickier sections dispatched in style! The moves into the chimney provide the first crux, but Joe needed very little thinking time and soon wriggled into it’s confines. 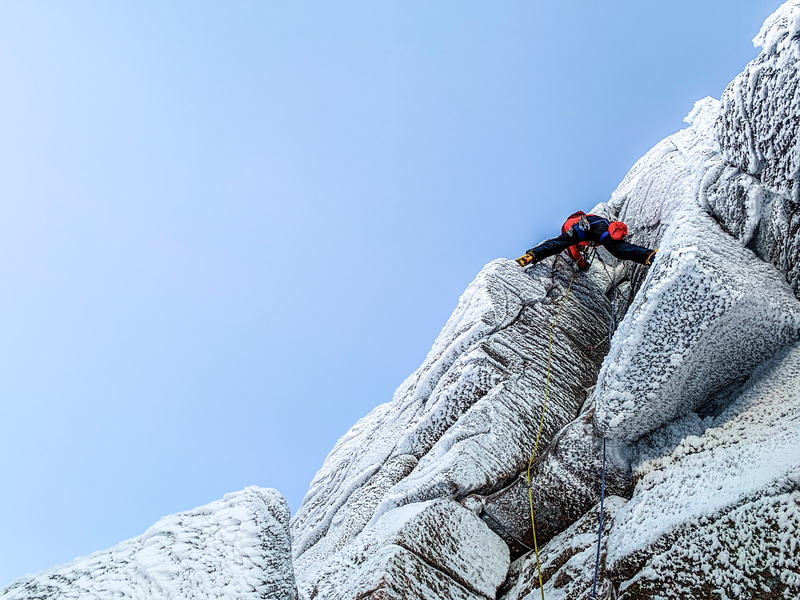 Hopping between the better footholds on sinker hooks, he made smooth progress and exited the chimney to face the second crux – a mantel-shelf onto a ledge. A good impression of a beached whale followed by a lay-back up a tricky corner saw Joe happy at the belay after his first grade VI lead! Joe ensconced in the back-and-foot section of the chimney, where improving footholds on the right wall allow a moment of respite! Andy followed quickly and also made short work of the pitch, seeming to skip through the difficulties. 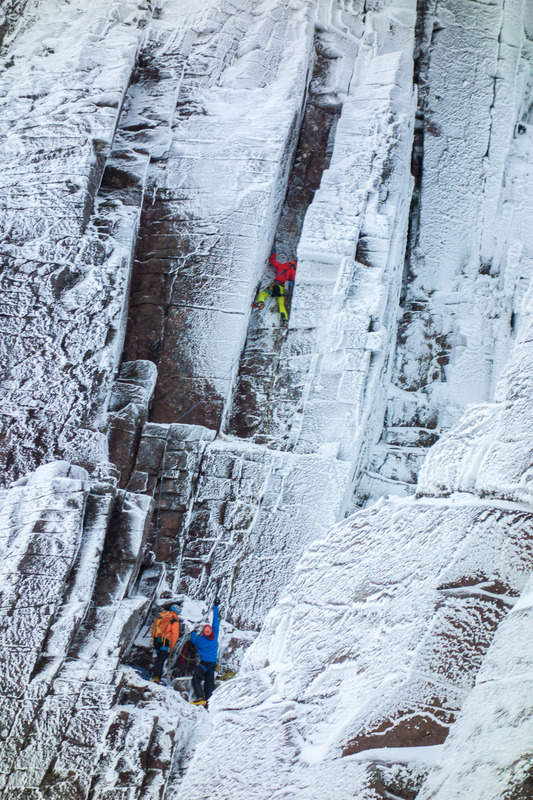 I, however, was experiencing a high-gravity day and took my time, absolutely determined to climb the pitch cleanly. 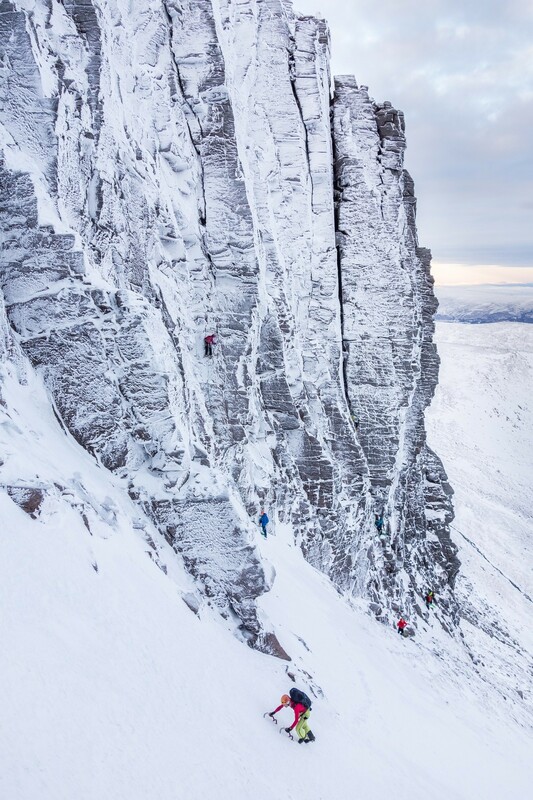 It was a good excuse to savour the moves though – one of the best mixed pitches I’ve climbed! The climbing on the second pitch didn’t let up at all and it didn’t feel much easier than the first; just slightly less sustained. It was clearly no issue for Andy, who made excellent progress in a spectacular position through more bulges and short chimneys. The final bulge was a tricky little number, but we were soon on the plateau for tea and medals, trying to decide what to do next. Andy getting busy with one of the numerous short sections of squeeze-chimney on the second pitch. Crystal clear views to the west coast from the top of Coire an Lochain. 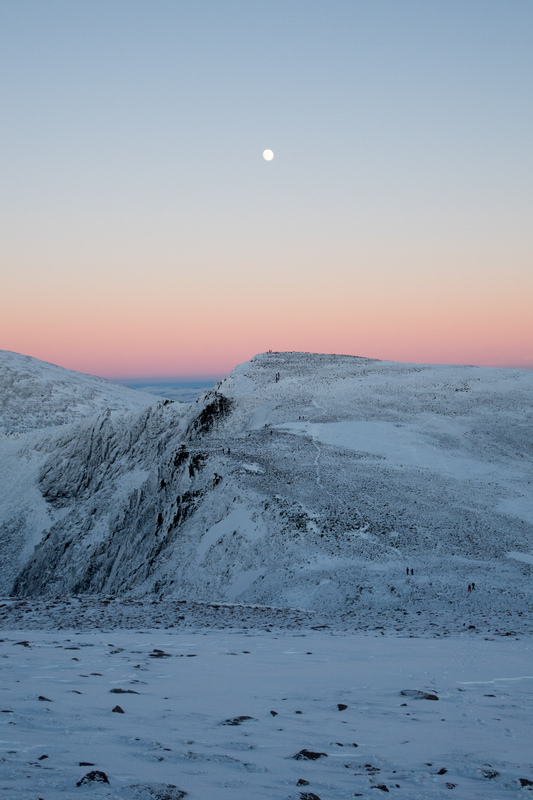 Cairn Toul, Braeriach and Sgor Gaoith in the foreground. With time on our side we mooched over the plateau and around to windy col, before depositing bags and dropping down easily to the base of the Mess of Pottage. The crag was still crawling with teams and after much deliberation Andy and I decided on The Message (IV, 6), while Joe headed off to take photos. 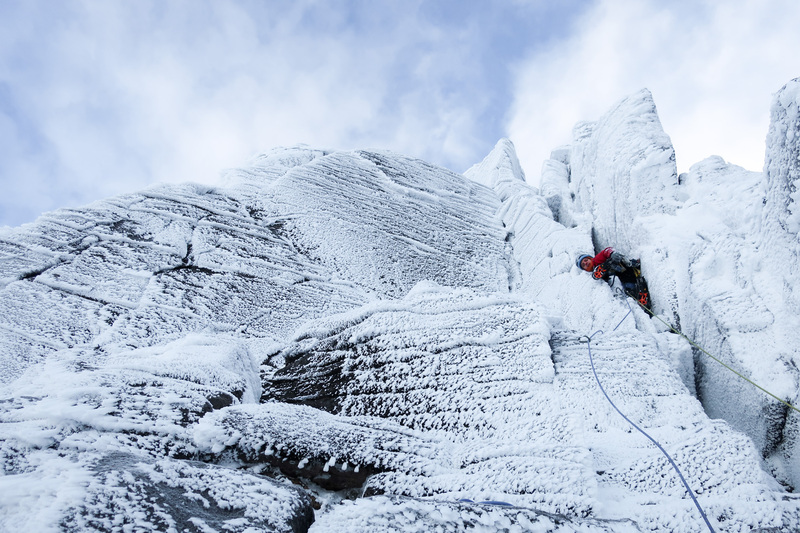 The first pitch was heavily iced so protection only came at the first mixed steps higher up. 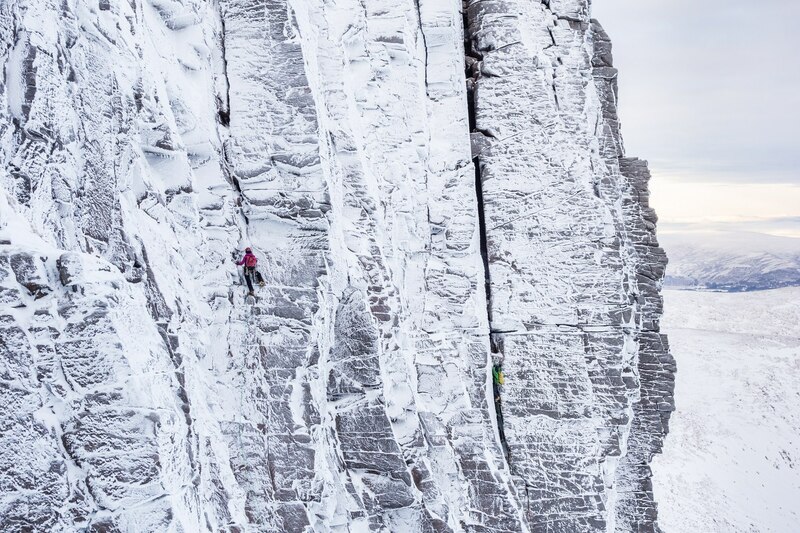 The climbing was fun and straightforward, barring the final corner to the belay, which requires some stiff pulls with feet pressed high in a flared crack behind you. Andy fired the second pitch in good time, only pausing on the slim left-hand corner at the start of the pitch. This perplexing section was considerably harder than the famous corner above; which afforded continuous positive hooks and nice bridging positions. 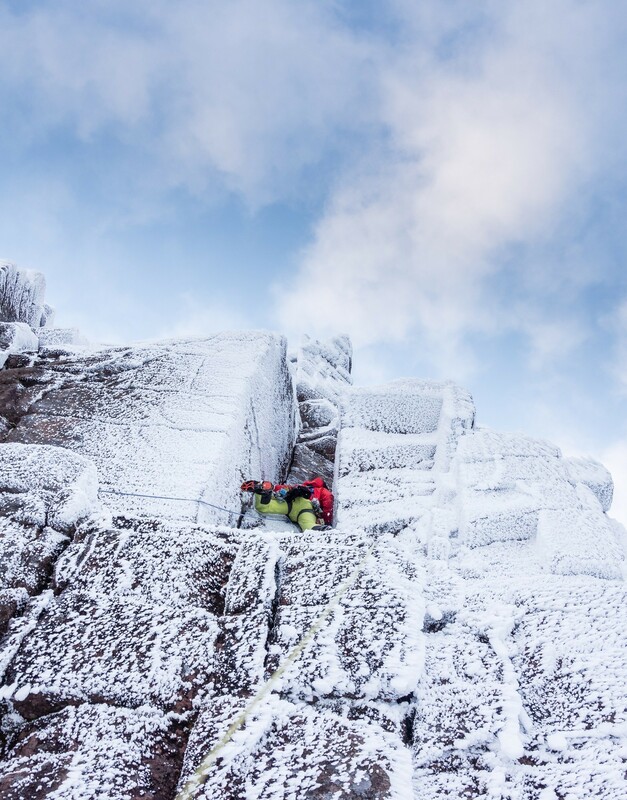 The final pitch involves another corner before a spectacular pull out left onto the arete leads you up slabby steps to the top. We were greeted by a stunning pink sunset and a moon so bright it cast our shadows on to the snow as we walked happily back down. Two classic routes in good condition, in great company, in perfect weather – I won’t be forgetting this one in a hurry!